to my room; I figured that would lure them in. They’re shaped like fish,right? So maybe they'll feel more at home? And who doesn’t love Swedish Fish? I wondered after a while in the tub if maybe they were shy, so I figured if I left the room for a while they might feel safer. So I went out for dinner. Dinner was okay. They call everything different names over here so I had to order by the pictures in the menu. When I got back to the hotel room I heard scratching inside the bathroom door. It was closed, but I definitely would have left the door open for the Nixies. Maybe they were modest. I crept to the door, because I didn’t want to startle them. I peeked in and saw the cutest, fattest, fluffiest Nixies ever. I didn’t know Nixies had tails, but you learn things in this profession. I threw open the door and greeted them to the world of menfolk. They made these little squeaking noises and ran to greet me. They jumped on me and their little claws sure were sharp. Nixies have strange greeting rituals. Kinda painful. A man from the next room heard that the Nixies had arrived and so he ran in. I thought he was there to say hello, but he started batting at the Nixies with a fly swatter. Maybe it’s part of the Nixie greeting ritual? They all jumped on him. He ran from the room with them and down the hall. I go through all that work and he steals my quality Nixie time. 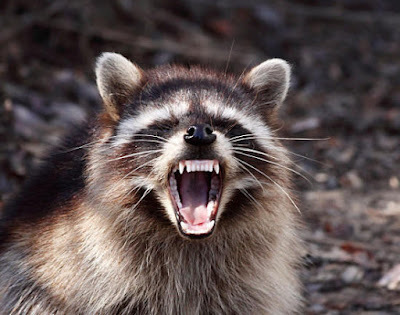 Anyway, about an hour later, German police arrive and tell me that they ( the Nixies) were racoons and that I should go to the emergency room and get checked for rabies, as if faeries carried gross diseases.